Music Practice Journal: A daily journal to track your musical progress for a year, created by Allysia and Logan from PianoTV. 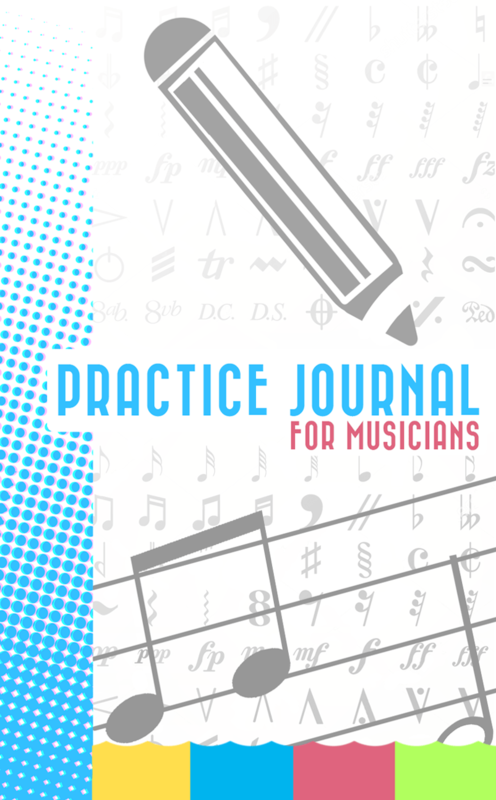 This journal provides the space for you to record your daily music practice with any instrument, from piano to trombone, for a full year. It’s meant for concise notes of up to five pieces per day, in addition to notes on technique, sight reading, ear training and listening exercises. It’s difficult to keep track of practice goals and progress. For years I used simple, plain notebooks to keep track of my practice, but the results were iffy. It took too much effort to write everything down, so I would abandon the process after a while. I decided to take matters into my own hands and create a practice journal of my own. I wanted it to be something small that I could write short notes in, but something that would also allow me to see my long-term growth and progress. It was important to me that this journal be compact yet practical – however, I also wanted it to look good! That’s why the entire journal is in full color. Colored pages make your notes stand out more, and also make it easier to see the passage of a month’s practice at a glance (each month is a different color). Each “week” of practice in this journal contains six practice entries. Each “month” totals to 30 days. You can either skip the spaces you don’t practice, or simply fill in each space when you do practice, regardless of month. This music practice journal contains all the elements I deem essential to well-rounded practice, based on my 10-year teaching experience. Its small size makes it a dream to carry around. It will also benefit your music lessons since your teacher (if you have one) will be able to see the work you’ve been doing at a quick glance. In this YouTube video, I explain the details of the journal in more depth. Be sure to check it out! If you’d like to check out the book on Amazon, click here. It’s also available directly from Createspace. If the shipping costs are prohibitive or you’d enjoy a lower price tag, you can also download the PDF version as well.